July is cherry season, and we’re doing our best to take advantage of it! At one point Washington cherries were 99 cents a pound, so I’ve made our favorite cherry pie twice, tried putting fresh cherries in cobbler (good, but not as good as cherry pie) and tested a new recipe for vegan cherry muffins. I wish I’d tried these sooner because they are some of the best muffins I’ve ever made. Amazingly, the muffins hold together without any eggs, and the interiors are moist and tender thanks to the vegan yogurt. Here’s a picture. 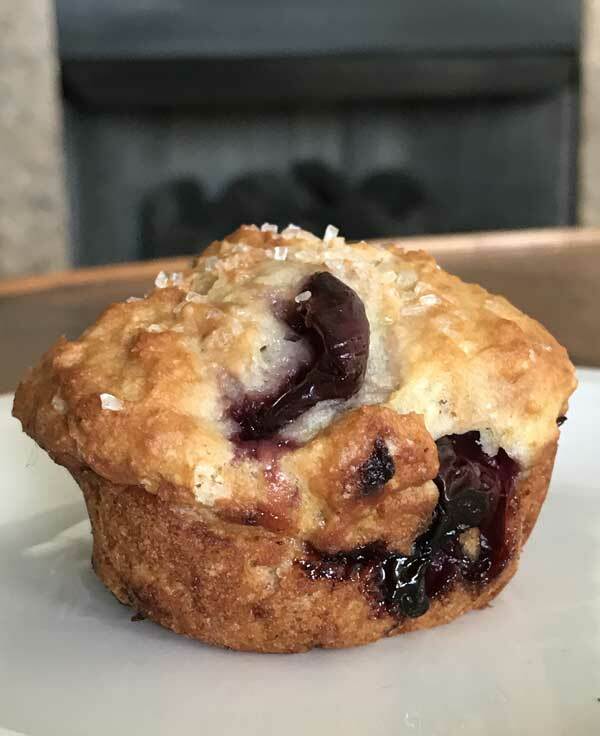 They taste like cherry pie in muffin form, and while the amount of almond extract might seem high, two teaspoons is just right. I admit, I didn’t even add the almonds, but between the almond extract and almond milk the muffins have plenty of flavor. The recipe is a spin-off of the Cherry-Almond Muffins from Vegan with a Vengeance, and I’ve changed it slightly by using almond milk and coconut oil. I still can’t believe what a great texture these have and will make them again for sure — hopefully with almonds (though I think I’d put them only on the top). 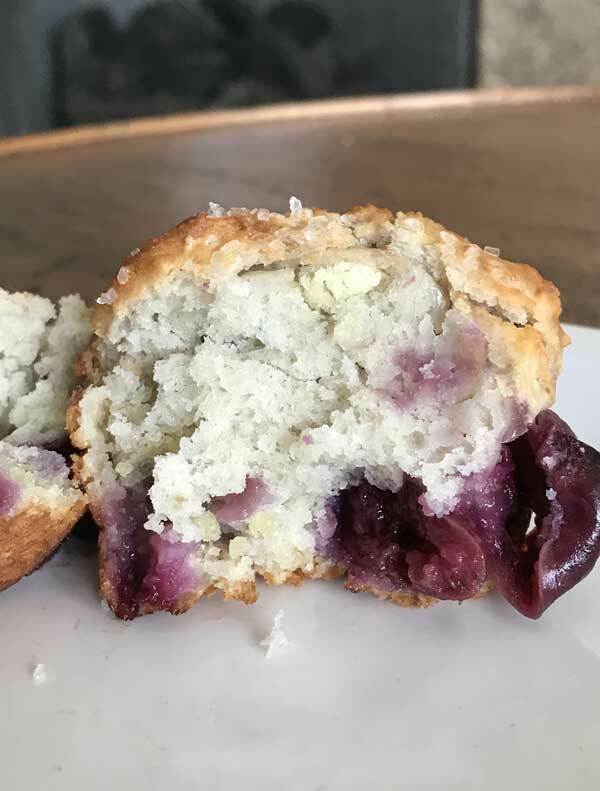 These not-too-sweet muffins are made with fresh Washington cherries and almond extract. Nuts are optional. I loved the crunch of the coarse sugar topping, so if you have some coarse sugar it's perfect here. Preheat oven to 400 degrees F. Grease 12 muffins cups. In a large mixing bowl, thoroughly mix together the flour, sugar, baking powder, baking soda and salt. Make a well in the center of the bowl and add the oil, almond milk, yogurt and extract. With a heavy duty scraper, fold everything together until fully blended. Carefully fold in the cherries and nuts (if using). Divide batter evenly between the muffin cups and sprinkle tops with sugar. Bake for 18-22 minutes or until a toothpick inserted in the top comes out clean. Thanks for the feedback, Debbi! I’m glad you liked them and hope you try the almond extract version soon. It makes them taste like cherry pie or cherry flavored Pop Tarts! Just made them swapping out the almond milk for cashew milk, and the cherries for blackberries. I added the almonds because I didn’t have any extract. Oh, and I used SoDeliicious vanilla coconut yogurt. I really liked them, but I know the extract would have packed a little more flavor into them. Next time, because I know I will make them again! Thanks for this yummy looking dairy free recipe! I can’t wait to try it! Did you use a flavored yogurt or plain? Going cherry picking on Saturday so this recipe is perfect timing. Sure! Just drain them really well and pat dry. Do you think Trader Joe’s Morello cherries work here? My favorite go-to banana muffin recipe has no eggs either. So I just always make it vegan now with almond milk instead of buttermilk. I let it sit a few minutes with a splash of vinegar. This is probably the first muffin recipe in a long while that has piqued my interest. They look amazing! Yes, there are a few! Here’s a good list. I love that you post about things I’ve never heard of. Like vegan yogurt. I didn’t know it existed. The muffins sound so good! !